You pilot a helicopter through side-viewed terrain. Your job is to take out the enemy forces and their base, initially armed with missiles, bombs and machine guns. Watch out for enemy anti-aircraft balloons. However the game differs from most Choplifter style games by involving management of a squad. You have tanks, explosive vans, engineers and infantry units which can be ordered from the base, and must then be protected from enemy fire. Supplies are limited by financial constraints, as every unit and weapon has a price. The game was developed for the black and white screen of the Mac Classic as well as the more colorful screen of the Mac LC, and these graphics were ported over to the PC, making it one of the only games ever released for the PC to support EGA's Monochrome graphics mode. It was one of the few cross-platform games that had true cross-platform networked multiplayer options. A Mac and a PC could play against each other, for example. The game supported multiple modems-to-modems networking years before Kali, etc. existed. 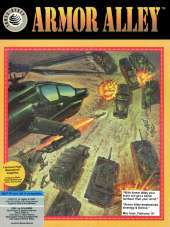 Players could fight someone over CompuServe by going to a specific forum, making a connection with another gamer, then exiting the dos-based CompuServe terminal program without dropping the line and starting up Armor Alley.